Dogs have long been known as man’s best friend, but is synthetic pet grass your dog’s new best friend? About 85 million US families have at least one pet, and that often includes a dog. We love dogs at Watersavers Turf. As a leading supplier of artificial turf, we know a lot about using it for pet runs. 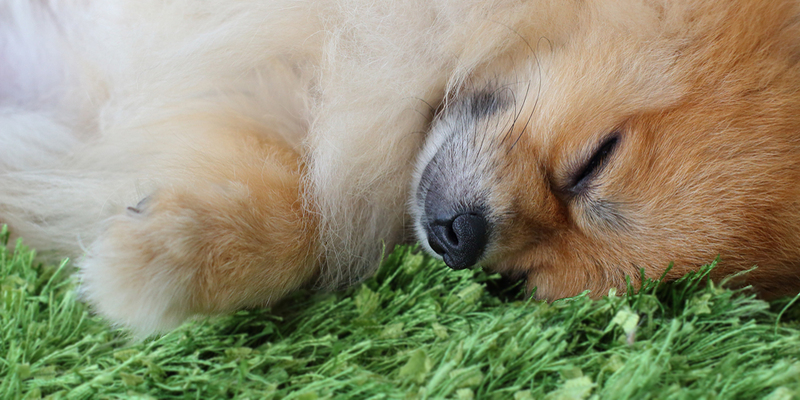 So, we would expect that synthetic pet grass could be your dog’s new best friend. While it could never replace human friendship, it can make dogs very happy. Why? It’s because synthetic pet grass gives them a safe, clean place to exercise and play. Whether you have a big yard or a tiny yard, a large dog or a small dog, at times your pet needs to be outdoors. To go for walks, to do their business, to get some fresh air – canines like to be outside. Depending on your family’s lifestyle, you may need a pet run to help make life easier for all. If you are a dog owner who doesn’t know much about plastic grass, you’ll be surprised to learn how pet-friendly today’s products are. A good place for you to start would be our info on dog runs, which covers all of the key points. Dogs are happiest when they are with the humans they love. Yet, they are also happy whenever they are free to run, play and relieve themselves. Artificial turf makes it easy to keep your dogs cleaner, safer, healthier and happier. It is a good thing that synthetic pet grass benefits pet facilities because most of them need all the help that they can get. As places that are both happy and sad, many shelters depend on the help of kind-hearted volunteers who love animals. These are people who help to feed, clean and exercise the dogs who are housed there while they wait for new homes. In both cold and hot climates, synthetic grass benefits pet facilities in ways that real grass does not. At Watersavers Turf, we believe that anything that makes life better for the pets in animal shelters is worthwhile. Let us explain just how synthetic grass benefits them. Dog shelters all across the US have been replacing natural turf with fake because it can be kept cleaner. Dogs in close quarters can pass germs and viruses more easily, which is something that shelters try very hard to avoid. For dogs that spend their outdoor or indoor play time in areas covered by fake grass, that risk is lower. Moisture passes through our brand of pet grass more quickly, so that it can be kept cleaner and free from germs. This is one of the keys to preventing the outbreak and spreading of illness in animal shelters. Another benefit for shelters is that fake turf can save them money. It uses far less water than a real lawn, and the cost of water is not going down. Using pet grass for dog runs can be a “home run” if it’s done right. Before you start, doing a little homework about the best products to use can pay off. There are many places that sell pet grass for dog runs to choose from. Among those places, you will find that a variety of products are offered. You might go into this thinking that the best pet grass for dog runs would be the cheapest option. After all, it’s going to be soiled by dogs on a daily basis. But there are some other ways to look at this. Your dog run is also going to be a play area for your dog. It’s something that you and others will see. It may even be an area that is part of a totally synthetic lawn. The cheapest products are going to look like it. They are not going to drain nearly as well as better turf products. They are not going to resist damage nearly as well. It may end up as money wasted when they have to be replaced, again and again. You’ll get more value from using better quality fake sod products. You’ll also get some important features that can make life at home better for you and your pets. At Watersavers Turf, we have dog grass and products that banish odors. We have organic, non-toxic infills that are great for turf that is used by dogs – and kids. We also offer turf that is created to hang tough with heavy use (kids and dogs, we’re looking at you). The cheaper choices just can’t do the same things for you. People who have artificial lawns love to talk about their dogs as much as anyone else. At times, they talk about things that wouldn’t occur to people that own real lawns. Some comments found in online pet blogs are good examples of this. Dog owners with artificial lawns comment on how it reduces flea problems. Those living in rainy areas comment on how much it reduces dirt from muddy paws. These are things that would not apply to dog owners with real sod yards and dog runs. They probably don’t know that reducing their dogs’ flea and mud issues are as easy as switching to artificial lawns. Another comment was on the issue of dogs digging up natural lawns. They can cause a lot of damage to a yard. But dogs don’t dig up plastic grass because it doesn’t have the same smell as natural. Need Some Help with Your Pet Turf Project? It’s fun to visit websites like this one to see some great ideas for projects using pet turf. Where can you go when you need more than ideas? For real help from the pros, visit us at Watersavers Turf. How you do this is up to you. You can phone us at 844-974-8873 … you can chat with us online at our website … and you can visit us at any of our SF Bay Area store locations. We will be pleased to help you with your pet turf project and provide you with a free estimate. After all, doesn’t man’s best friend deserve the benefits of the best artificial grass?